In life, small incidents even hold great memories. A gathering of old school friends, engagement party, daughter's first birth day, and an award ceremony at office – photographs capture all those once in a life time moments and keep them lively. As these memorable photos and videos are precious, users usually keep them with care. Still, there are occasions, when photos get unreadable following virus/malware infection, file system corruption, operating system corruption or contradiction with newly installed hardware/software. Accidental/intentional deletion or formatting of the storage media is the major reasons behind losing precious photos and other multimedia files. In these cases of photo loss, you do not have any choice but to opt for a good photo recovery software to recover the lost files. However, at time, your photos get inaccessible due to problems in the operating system or file system of the memory card, memory stick, hard drive or other USB media. In such situations, usually if those problems are resolved, you can spontaneously get back your inaccessible photos. Media is accessible – If the storage media is accessible but the photos are either unreadable or are not found in their source location, then there is a possible suspect for virus attack. Update the antivirus application in your system and scan the media. This will resolve problem related to virus/malware infection and you may get back your photos. Media is inaccessible – If the storage media containing your photos has become completely inaccessible, then the problem either lies with it file system. There are a number of reasons for which the file system of your memory card or other media gets corrupt. In case of system hard drive, the reason can even be the malfunctioning of the corresponding operating system. In Windows, 'FSCK' and in Mac, you can take the help of Disk Utility to get rid of these problems. However, there are certain complicated situations, when the above discussed means do not work. Moreover, if you want an easier and safer photo recovery medium, then you can take the help of Stellar Photo Recovery software. Stellar Photo Recovery comes in two different variants – one for Windows based storage media and the other for Mac. These advanced photo recovery software are immensely powerful and designed to recover photos as well as other multimedia files from any instance of data loss. 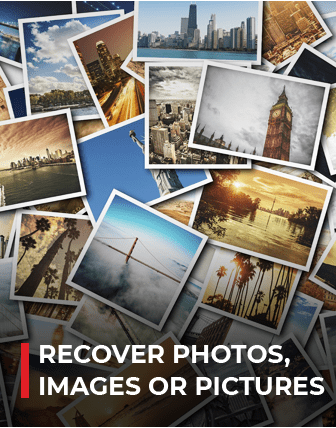 Most importantly, Stellar Photo Recovery is 100% risk-free and recovers lost/inaccessible photos in 3 easy steps – Select Media, Scan and Recover.